X-Men are a team of superheroes that protects the human race in the movie series done by Marvel. Game developer, Playtech, has brought these superheroes to a casino near you! 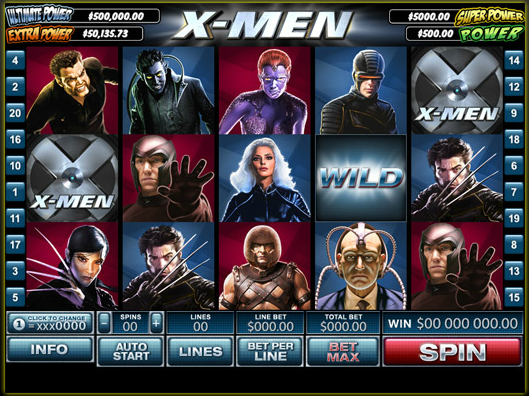 The X-men slot game is one among the Marvel slot series by the second biggest game producer in the world. X-men superheroes contain the X-gene that gives them the beyond human capabilities. Professor Xavier, the oldest of the X-men, recruits the superheroes and trains them to protect the world from the enemy brotherhood of mutant super-villains led by Magneto. The X-men team is composed of Xavier (their founding father), Wolverine, Storm, Nightcrawler, and Cyclops. On the other hand, the Supervillains are Magneto (supreme leader), Mystique, Rogue, Juggernaut and Sabretooth. All the characters mentioned appear in the Imagery used in this game. All the symbols in use have a particular animation. Each time you enter the X-men slot, you are ushered in by the X-men logo (scatter symbol). The symbol rotates 180o with the Wild breaking into mutation of the human genome at high speed. All the superheroes and super villains alike invite you to the game with a display of their unique super powers. I would recommend that you watch Mystique’s animation. Remember her power is to clone other people’s looks. In her animation, she morphs into the other characters creating an incredible animation. Other animations in the slot include Cyclops shooting red laser rays from his eyes; Storm creates lightning flashes while Nightcrawler disappears as he pleases. Unlike other Marvel slots, X-men is not accompanied by background music unless during the free spins and the About screen of the game. X-Men wild symbol can be replaced by any other symbol except the scatter symbol, meaning higher chances of winning. If you land two or more wild symbols on any active line, you get to enjoy a separate payout. The wild bonus payout is done instead of the regular payout if the wilds are larger than the regular win. X-men slot has a generous scatter bonus as compared to other Marvel slots. The scatter bonus is activated when you land two or more X-men logos anywhere on the reels. The scatter payout is multiplied by the total bet. The more the Scatters you land, the larger the payout multiplier. Another feature to look out for in this Marvel slot is the X-feature. The X-feature comes into play during the regular spin. It is activated when all the five hero symbols create an X on the reels 2, 3 and 4. This is on condition that the Hero Symbols forming the X are not identical. The X-feature is rewarded with a 5x-the-total-bet extra win. I.e. in addition to the scatter and regular wins! Having three or more scatter symbols on any place on the reels is awarded by getting eight free games. The games are played in two different modes- the heroes mode and the villain mode. The heroes’ mode always goes first followed by the villain mode. The eight free Games are played on a total bet equivalent to the one of the spin that activated feature. Plot twist: During the Heroes mode, the reels spin upward instead of downwards! Then the free games countdown is paused meaning you get to enjoy the same number of free spins until the villain mode is activated. The symbols in this mode are the wild symbol, the Heroes and the Magneto symbol (acts as an Extra Wild and when it lands anywhere on the third reel switching the mode to the Villain's mode). During the Villain's mode, the reels spin downwards like in a regular game play, and we have a countdown timer of the spins remaining. The timer decreases by one for every spin that is made in this mode. The symbols in play here are the wild symbol, the Villains and Xavier (Plays Extra Wild and switches the mode when it lands on reel 3). X-Men slot is linked to famous four-level Marvel Mystery Jackpot. This means that you have a chance of winning any of the four jackpots. This progressive jackpot is triggered randomly, but it is more likely to be triggered at larger wagers.